I intended to post a message last week to let you all know that season two is at an end and birdbee is off for the next couple of months on vacation, and I just realized that I never made that announcement. 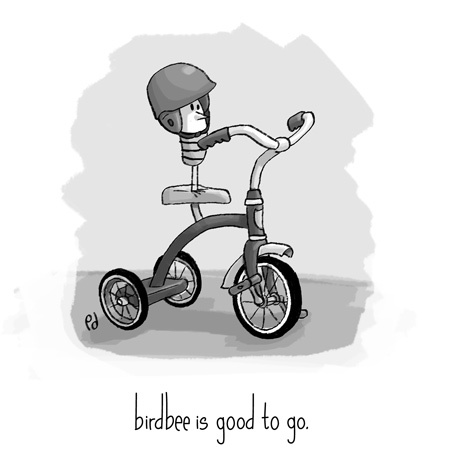 My apologies to anyone who was looking for a new birdbee drawing this morning. Watch for the start of season three of birdbee sometime in late August-early September. Have a great summer (or winter depending on where you are)! This entry was posted on June 3, 2011 at 1:04 pm and is filed under art, birdbee, news, season 2. You can follow any responses to this entry through the RSS 2.0 feed. You can leave a response, or trackback from your own site. I miss birdbee terribly.. any plans to start up again? Hey birdbee, I miss you too…! I’ll look forward to his return. Did I miss something? Has birdbee moved? It’s almost December. Has he had a change of heart? Will he never show his face again? Is he still on vacation? Was he caught cutting the heads off parking meters? Has he been incarcerated? Is some big, old, ornery dude screaming at him, “What we have here is a failure to communicate.” Woe is me. I miss birdbee. birdbee has not gone all “cool hand” on us. It’s ture I have not been documenting birdbee’s adventures for the past few months. I will not try to make any excuses here. I think birdbee will return, however, but things might be a bit different.